Description: Gregory of Nyssa�s fifteen homilies on the Song of Songs offer an important resource for the history of Christian biblical exegesis, as well as for the history of Christian ascetical and spiritual teaching, and stand alongside Origen�s commentary on the Song as a source for the later interpretative tradition. In addition to offering the original text and first English translation of all fifteen homilies, Norris provides an analysis of the characteristic themes of Gregory�s ascetical teaching, emphasizes its connection in his mind with the institution of baptism, and stresses the degree to which Gregory sees the teaching of the Song as addressed not to a special class of believers but to any and all Christians. Citation: Mark DelCogliano, review of Richard A. Norris Jr., trans. 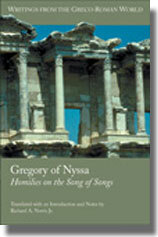 Gregory of Nyssa: Homilies on the Song of Songs, Review of Biblical Literature [http://www.bookreviews.org] (2013). Citation: Frank England, review of Richard A. Norris Jr., Gregory of Nyssa: Homilies on the Song of Songs, Review of Biblical Literature [http://www.bookreviews.org] (2014).